Michele Brus started her company, FatBoyz Erecting, to provide experienced crews and tower crane services to high-rise buildings, hotels and hospitals all over Florida. 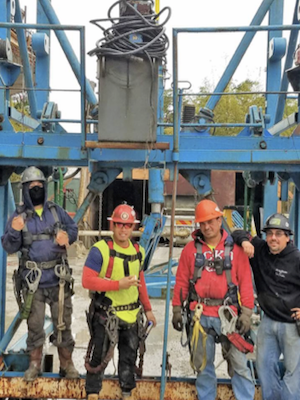 Collectively, the FatBoyz crew has more than 30 years’ experience servicing tower cranes. As the CEO and office manager, Michele handles the office work for FatBoyz. She was updating the company’s QuickBooks® Online (QBO) account when a pop-up advertisement for the "Connect an App Sweepstakes" appeared on her screen. To enter the sweepstakes, all she had to do was connect at least one of five featured apps to her QBO account, and she would have the opportunity to win $5,000, plus an iPad. She had been using QBO for two years and really liked the product, so Michele found it easy to use with quality customer support. Out of curiosity, she looked at the app choices available and realized the company could really benefit from Fundbox, an app that gives small businesses access to credit through the information in QBO. Michele was first attracted to the Fundbox app because her customers typically pay the company 60-90 days after a job is completed. However, she needed to pay their crane operators much sooner. In addition, sometimes they needed help with working capital and borrowing money from banks, which took far too long. Because Fundbox could potentially solve this big problem for her, she decided to give it a try despite having never connected any other apps to QBO. Michele didn’t have to spend time reentering numbers. She was approved for the funding by the next day and the funds transferred into the company’s business account immediately. Michele also liked that the app was online and connected to QuickBooks, so she never had to walk into a bank. Since FatBoyz Erecting’s office is a truck and a trailer that travels around to job sites, everything relating to FatBoyz business needs to be mobile. Not only did Michele find a great business tool for FatBoyz that she definitely plans to use again, she also won $5,000 and the iPad. Naturally, she put both prizes toward growing her company. “There’s always something new we need around here,” says Michele. And, with a base like Fundbox and QBO, FatBoyz can continue to build a towering business. To learn more about how you can improve your working capital with Fundbox and QuickBooks Online, click here.